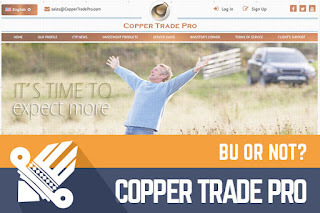 DavidNews HYIP blog - News & Reviews: Copper Trade Pro - BU or not? Copper Trade Pro - BU or not? Since 21st of March listed on the Sticky listing, you can find a project called Copper Trade Pro what is online nearly 60 days and where I made a $360 reinvestment. Copper Trade Pro is a professionally managed project, and because of that, it is very popular in HYIP industry already. The project offers for us long-term investment plans, and it is clear that administration has settled here to stay with us for an extended period. I find it attractive that when you open Copper Trade Pro at the first moment, you will see something like presentation page, but the best thing - it does not resemble typical investment website that we have used to see. Another positive thing about Copper Trade Pro is the amount of content - on the site you will find a lot of it, and it is available also in Russian, Spanish, and German what makes this project more accessible to a wider amount of HYIP investors. As I mentioned in the introduction, Copper Trade Pro offers long term investment plans, and that is the primary concern why countless persons find this project particularly attractive. All investment plans are 100 business days long, but since there are just five working days in a week, the overall term will be 140 days. So, if you invest today, you will receive returns from Copper Trade Pro for more than four months. The pure profit that you can earn this is the project is in a range starting from 140% up to 220% depending on your investment amount. Just one extra thing - investment plans of this project are very sustainable; the initial deposit is included in the payments, and this is the crucial aspect that might help to keep this project online for a long time. Right before totaling everything up it is time to talk a little bit about rumors. You can read around that some people are spreading talks that this project has something to do with legendary Benson Union project, but I will be straight with you - this project have nothing to do with the Benson Union, and that is evident for everyone that took part in the Benson Union. It was one of the first HYIP where I invested (and made a profit) long before I started this blog and I remember the Benson Union rather well. Yes, some parts of this web page (like texts and order of sections) are similar, but let us face the reality this content is just obtained from the Benson Union website and used in the Copper Trade Pro project, so only connection between both projects is similar content, nothing else. In conclusion, even the concept of the project comes from some other previously successful project appears that everything is working accurately. Investors in the industry talk a lot about Copper Trade Pro, and talking is one of the elements that drives any projects forward. Overall the administrator has an excellent approach, and I think that there is a great potential for this project to become one of the most attractive ones in this investment season (maybe for some investors this already is the most attractive project). In any case, as usually everything will show future and if you deposit than only that you can afford to lose. Investment plans: 2.4% up to 3.2% daily for 100 business days, initial deposit included in the payments. Join Copper Trade Pro Here! You should remember that the #1 Bitcoin exchange service is CoinMama.